For a long time, American workers typically relied on pensions to make ends meet in retirement. That scenario, of course, has grown less common with the disappearance of corporate pension plans and the rise of employee-funded 401(k) plans. Nevertheless, a good pension is still the gold standard of retirement plans, with guaranteed income for life. Governments have typically used pensions and other benefits to attract workers who may otherwise have taken higher paying private sector jobs. But many states now find themselves struggling to meet obligations they made years ago to workers, as some pensions lack long-term funding. Workers who find themselves out of a full pension may end up struggling to pay for their retirement without the help of a savvy financial advisor. In light of all of this, we wanted to discover which states have pensions that are in the best shape. In order to rank the states with the healthiest pensions, we looked at data on four metrics. Specifically, we compared funding ratios, returns on holdings, beneficiaries to active members and active membership rates. Check out our data and methodology below to see where we got our data and how we put it together to create our final rankings. Northwest scores well - Washington, Oregon and Idaho all took top-10 spots in this study. Good regional variability - While the Northwest stood out as a region with strong public pensions, there are examples of healthy and unhealthy pensions in all regions of the U.S. In the top 10, the West, Midwest, South and Northeast all have representatives. The same is true in the bottom 10. The Evergreen state takes the top spot. Across all the metrics we analyzed, Washington ranks no worse than 13th. In particular, the funding ratio is fairly high: 84% of the Washington pension plan’s liabilities are funded. In that metric, Washington ranks ninth. Washington also has 1.75 active members for every beneficiary receiving periodic benefit payments. That there are more working members actively contributing to the pension plan than there are retirees receiving benefits increases the likelihood the plan will stay healthy and solvent. Idaho has an even higher funding ratio than Washington. Around 88% of Idaho’s pension liabilities are funded, a top-seven rate. Idaho pensions are also doing a good job investing and receiving contributions. In 2017, income from investments and contributions exceeded total payments by $1.7 billion, equal to 11% of total assets and cash. Another Western state takes the third spot. Nevada scores well due to the large number of active members relative to beneficiaries. That should improve the long-term viability of Nevada’s pension. In both active members per beneficiary and active membership rate, Nevada ranks in the top 10. Another plus for pensioners here: Nevada does not tax any retirement income. Like Nevada, North Dakota secures a top-10 spot on the back of its healthy active membership figures. There are about 1.7 active pension members for every beneficiary in North Dakota, and 81% of all pension members are actively contributing to the fund. North Dakota is an attractive state to spend your retirement, from a wealth-preservation standpoint. North Dakota does tax some pension income but offsets that with a low cost of living. Arkansas scores above average in all our metrics. According to the latest estimates from the Pew Charitable Trusts, around 77% of Arkansas’ pension liabilities are funded. In that metric, the state ranks 15th. In fact, Arkansas ranks in the teens for all our metrics. The state pension invested well, and after tallying up contributions and beneficiary payments, we found the Arkansas pensions system earned $2.8 billion in 2017, equal to 10% of cash and assets. Another Pacific Northwest state secures a spot in this top 10. Oregon pensions have about 81% of their liabilities funded, the 12th-highest figure in the study. This state also boasts 1.85 active members per beneficiary and an 86% active membership rate. In both of those metrics, Oregon ranks in the top 10. Oregon does partially tax pensions, and withdrawals from retirement accounts are fully taxed. That makes the Beaver State a mixed-bag as a place to spend your retirement. 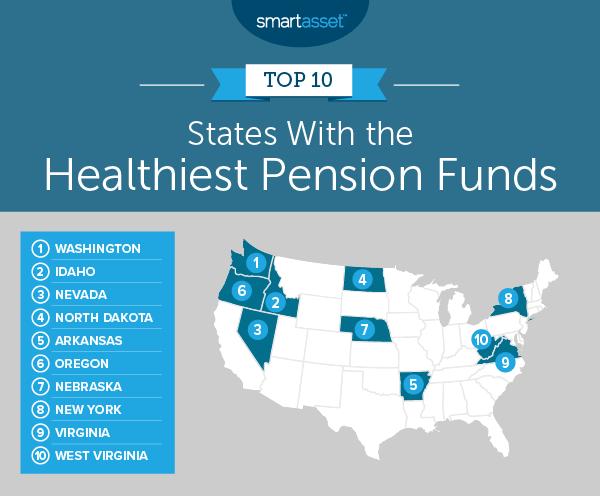 Nebraska has one of the best-funded pension plans in the country. According to our data, Nebraska has 89% of its liabilities funded, the fifth-most in the country. Nebraska also has 1.93 active members for every beneficiary, a good sign for its long-term funding prospects. One concern may be the large number of inactive members, though. Only 69% of pension members are active, according to our data. New York owes its inclusion in this top 10 to its high funding ratio. Our analysis reveals that 91% of New York pension liabilities are funded, the fourth-highest rate in the country. A high active membership rate also supports the New York state pension. Around 87% of all members in the pension scheme are active in New York, according to Census Bureau estimates. New York is a fairly good state to receive a public pension. If you’re older than 59.5 here, you can deduct up to $20,000 in pension income annually. Coming in ninth is the Virginia pension system. According to Census Bureau data, the Virginia pension system saw strong growth numbers in 2016. After combining costs and income, the Virginia pension system made a net return equal to 10% of its cash and assets, a top-10 rate. Virginia also has a high number of active members relative to the number of people receiving benefits. Virginia ranks 12th in that metric, with 1.57 active members per beneficiary. Finally, our list ends in West Virginia. This state saw the highest return on its assets in 2017, at 14%. Another good sign for the pension system here is the high active member rate. Around 91% of all pension members are active, the second-highest proportion for that metric. West Virginia only just cracks the top 10, because its pension has nearly an equal number of active members and pension beneficiaries. Funding ratio. This is the state pension system’s liabilities divided by its assets. Data comes from the Pew Charitable Trusts and is for 2016. Returns on assets. This is total net pension income, including investment income, contributions and payments, divided by its total assets. Data comes from the Census Bureau’s 2017 1-year American Community Survey. Active members per beneficiary. This is the number of active pension members per pension beneficiaries. Data comes from the Census Bureau’s 2017 1-year American Community Survey. Active membership rate. This is the number of active members as a percent of all members. Data comes from the Census Bureau’s 2017 1-year American Community Survey. We ranked each state in each metric. After that, we found each state’s average ranking. We then used this average ranking to create our final score. The state with the best average ranking received a 100, and the state with the worst average ranking received a 0. Save early - Of all the available retirement savings strategies, none can beat starting early. The earlier you start saving and investing, no matter how you do it, the sooner your money can start working for you. Over time, if you invest well, you may find your investments make you more money than your job does. Ask an expert - Retirement is a complicated process. You need to be able to foresee how much you expect to spend and how long you expect to live 40 years in advance. If you are not a financial expert, you run the risk of making some missteps. So instead of stressing yourself out about mistakes, why not get a financial advisor? If you’re not sure where to find a financial advisor, check out SmartAsset’s financial advisor matching tool. It will pair you with up to three local advisors who fit your investing needs.